The discovery of vitamin K at the end of the 1920s provided valuable knowledge of the basic functionality of blood clotting. However, vitamin K, more precisely, vitamin K2-7 can do much more. Osteoporosis and coronary heart disease. Is there a connection? Since the late 1970s, a vitamin-K-dependant protein (Osteocalcin) is known to be essential for bone metabolism. It occurs naturally in its uncarboxylated form (uOC) and requires vitamin K for its activation, i.e. carboxylation. Only in its activated form osteocalcin is able to incorporated calcium into bone tissues. Another protein (Matrix-GLA-protein, MGP) ensures that circulating calcium is not deposited into the walls of blood vessels, but is carried to where it belongs: into bones and teeth. MGP also needs vitamin K2 for its carboxylation, i.e. its transformation into an active form. Especially older adults show an increased level of uncarboxylated Matrix-GLA-Protein and osteocalcin. Supplementing with Vitamin K2-7 activates these proteins and helps to prevent arteriosclerosis, as well as loss of bone strength and density. Calcium intake without simultaneous supplementation with vitamin K2-7 increases the risk of coronary heart diseases and heart attacks by roughly 27%! This shows, that not only supplementing calcium requires the simultaneous intake of vitamin K2-7, but also a calcium-rich diet. 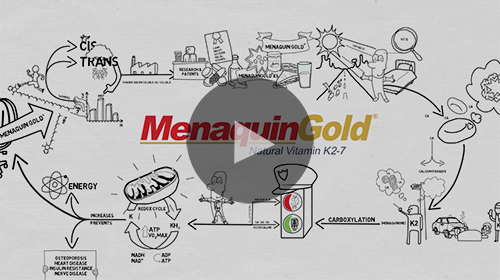 Menaquin Gold® – natural vitamin K2-7 is produced in a cGMP/ HACCP/ ISO 22000 certified biotechnology company under the control of Viridis BioPharma Pvt. The identification and characterisation are documented excellently, the methods of analysis and manufacturing processes are validated. Extensive safety and toxicity studies were the foundation of the approval as a novel food. Viridis BioPharma Pvt. Ltd. cooperates with global leading K2-research teams and helps detect and characterise more VKDPs (vitamin K-dependent proteins). During the past years, a whole string of further applications was discovered, described and registered. Several patents protect Menaquin Gold® in use against diabetic and non-diabetic neuropathies, muscle cramps, venous insufficiency, chronic fatigue, maximum oxygen intake and more. Please contact us for more information, specifications, and samples!